Ivory Coast police have fired tear gas at hundreds of supporters of President Laurent Gbagbo outside the main French military base in Abidjan. The protesters want France to withdraw its 3,800 peacekeepers, so they can march on rebel-held areas in the north. 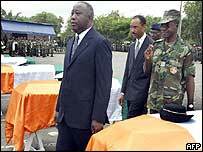 On Tuesday, Mr Gbagbo rejected the resignation offer of three generals, saying this would split the army. 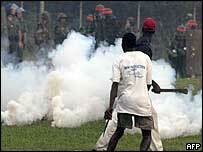 Their offer followed calls on national television by uniformed men for them to go and for a resumption of war. About 100 police, some armed with assault rifles, sealed off the French military base as protesters threw stones at them. "We will kill the French," some shouted. The Gbagbo supporters have been demonstrating outside the base since Monday and on Wednesday, French schools in Abidjan were closed, said Reuters news agency. One militant leader, Narcisse N'Depo, had warned that French citizens and economic interests would be attacked if the French troops did not pull out of the buffer zone and let them march on the rebel headquarters in Bouake. There are some 16,000 French citizens in Ivory Coast - the world's largest cocoa producer - and the former colonial power still has many economic interests. Both rebels and the government have accused France of bias during the year-long conflict. Rebel leader Guillaume Soro has accused Mr Gbagbo of orchestrating the unrest to discredit a French-brokered peace plan which set up a power-sharing government. Mr Gbagbo told French newspaper Le Figaro on Tuesday that he did not want the French peacekeepers to leave but he did understand the frustration of the youth groups and the soldiers. The richest country in West Africa has been divided between rebel-held Muslim north and government-controlled Christian and animist south for more than a year. There has not been much fighting since January, when a French-brokered peace deal to set up a power-sharing government was agreed. However, the rebels withdrew in September, accusing Mr Gbagbo of not respecting the terms of the agreement, while he insists that they disarm.